Your colleagues deserve something better than an afternoon of strategic games to aid lateral thinking and a “trust fall” exercise before lunch time sandwiches. It’s 2017 and your team away day should be interesting, challenging and educational, as well as fun. Your team away day really does need to be away: An afternoon activity in the private room in a local pub is ok, but is it memorable enough to stick in people’s minds (for good reasons) a year later? Take them away from their comfort zone, stay the night, out of their county into an environment they’d never normally be in. There you’ll find you’ve got their attention. It should be NEW: As soon as you organise something people have been to or done before, you’ve lost 50% of their focus and motivation. Go beyond their expectations. It’s your chance to make them feel special as a group. Choosing something that’s better than anything they’ve anticipated will make them excited and you nothing short of amazing! Plan well. You can manage the whole occasion on your own but when does that leave time for you to get the most out of it as well. A successful team away day is based on a well composed plan, personalised to the team and with as much engaging activity as there is time to relax. So plan all the details in advance, and pull in support to help you coordinate the day so it all goes to plan. So what type of team away day to go for? This is totally dependent on the dynamic of the group, how well they get along and what you want to get out of your time away from the office. If you are looking to do some work related activities, how can you make these more interesting, how can you use your environment or venue, in order for it not to feel like work yet still achieve your goals? Think of unique ways to design your day – perhaps have breakout sessions on the terrace, experience sharing on a walk or brain storming an idea whilst playing lawn bowls. Teams often respect the fact that at some stage they’ll need to do some work, but if you can lighten the mood and make the most of the new surroundings to help make work seem like play, you’re half way to success. If your team away day is a chance for staff to let their hair down and party then you really want to facilitate fun and opportunities for people to enjoy themselves. 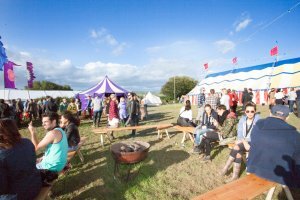 For large groups something like a festival style away day, with food stalls, fire pits, tipis and a music stage, can be great for new experiences and having a good time together. Once you are all on site, organising activities for large groups can be quite stressful especially when people are there to have a party too, so don’t try and schedule too much into the day. However, if you need to cover a few work related items, schedule them in the timetable (shared with everyone beforehand) for the pre-lunch slot so that you give them enough time to themselves. Festival style away days are not going to be for everyone, so do think of the personalities in your team first. For the more home comfort loving members of the group you can reassure them there are showers, loos, real beds and chargers for your phones. You’ll find that as long as people are well informed beforehand, they might approach it with trepidation, but by the end of it they have fully embraced life under canvas and wholeheartedly agree that getting out of their comfort zone is actually great to do once in a while. For smaller groups, you may have more budget to include activities. Dependent on the time of year, you might want to plan a trip out for the day. The venue you choose to stay in will have stacks of ideas about places to visit to suit all tastes. You don’t have to do something hugely elaborate for people to get a sense of a place: organise guided walks, orienteering, foraging or things that get you under the skin of the local culture a bit before heading back home. If the venue you are staying in has all sorts of games and space to entertain you, don’t feel you have to escape for the day either. People will appreciate the time to be still, with no agenda and to admire a beautiful view. For away days at Pennard House for example, one particular activity we offer are tastings of Somerset’s great selection of ciders. One of the reasons guests choose Pennard is to enjoy the idyllic, rural countryside and with cider apple orchards of our own, cider is a huge part of the local identity, so it’s nice to give them a greater sense of it’s character and learn some history too. 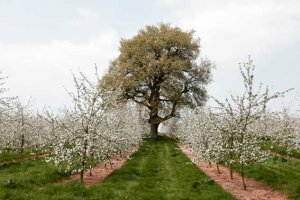 We can arrange trips to cider producing farms or have the experts come to our orchards. We try and be as flexible as possible when it comes to scheduling activities to make things work around your time schedule. We’re always open to new ideas and any activity that we haven’t yet thought of, we of course will work with you to make it possible. There is certainly a balance between work and play, organised activities and free time that you want to get right for away days. Working with the venue to make the most of what’s locally available, will make the trip more unique than if you apply some ideas taken off the internet. Pick an away day that best suits the majority of the group, their enthusiasm will be infectious and the heel draggers will not be able to resist enjoying themselves too. And always have a back up plan, agreed with the venue, to change at any moment the weather isn’t doing what you’d asked!! Be brave and your efforts will be rewarded! For more information on team away days at Pennard and how your group, large or small, can make the most of their time with us, please get in touch, we’d love to hear from you.